Thank you for taking our Micronutrient Sufficiency Quiz! Uh, oh! You scored between 0 and 9 – this means your body could be running on empty in terms of its essential micronutrients. It is imperative that you start making changes today. There is a high likelihood that you are micronutrient deficient, which is the most widespread and dangerous health condition of the 21st century. Your future health depends on increasing your levels of essential vitamins and minerals. Educating yourself on this topic will pay huge dividends in the future. By reading our book The Micronutrient Miracle and implementing our simple 3-step plan to micronutrient sufficiency you will learn how to increase your micronutrient sufficiency levels naturally, so that you can live the extraordinary life you were born to live. To help you understand the things that you are doing right and why you scored so low, we are going to send you a free quiz evaluation in an email later today. It will go over each of your answers and give you insight as to how your answers influenced your score as well as tips on how you can potentially improve your score. We will also include two bonus reports we feel you may find interesting. The first gives you shocking USDA statistics on just how deficient most of us are in our essential micronutrients, and the second will evaluate the link between micronutrient deficiency and obesity. You don’t want to miss them. First things first. We want to congratulate you again for taking the time to find out your score. Regardless of how you did there is always room for improvement. And we have a full-proof 3-step plan that we know can get you to that state of micronutrient sufficiency fast! There is one real actionable change that you can make right now that will greatly increase the likelihood of you reaching micronutrient sufficiency. It was vital in reversing Mira’s osteoporosis and we know it will help you to achieve the extraordinary health that you desire. 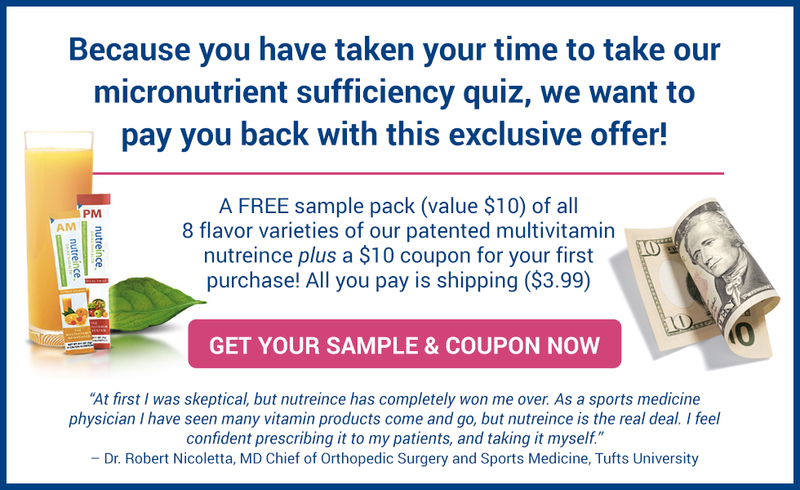 We want to offer you a chance to try our patented multivitamin nutreince for FREE. We formulated it to eliminate the 4 flaws that we just introduced you to that are blocking the benefits of over 99% of the multivitamins on the market today, Even if you already take a daily multivitamin, we urge you to try nutreince, and feel the difference for yourself.